Every summer for the past I’ve-lost-count-of-the-number of years, I’ve wanted to make a camp shirt out of this lovely lightweight linen. This year, as summer was drawing to a close, the stars aligned for me to tackle this project. Oops. Forgot to button the bottom button. So why “campish” and not camp shirt? Because I decided that I didn’t want to use a convertible collar that is found in camp shirts. I also didn’t want a patch pocket over the breast. I mean, it’s not as if women are going to put anything in that pocket and I don’t think it really adds anything to the look. The finished product is not everything I hoped it would be, but I learned some things in making it and now I can share those with you. First, I learned that the name for the weave of this fabric with the extra texture scattered about is dobby. This particular fabric is pretty loosely woven, which presented some challenges in getting it on grain for cutting and then surprised me by stretching out of shape in one tiny segment of the neckline. More about the headache that created later. For the pattern, I started out with my no-close topper. 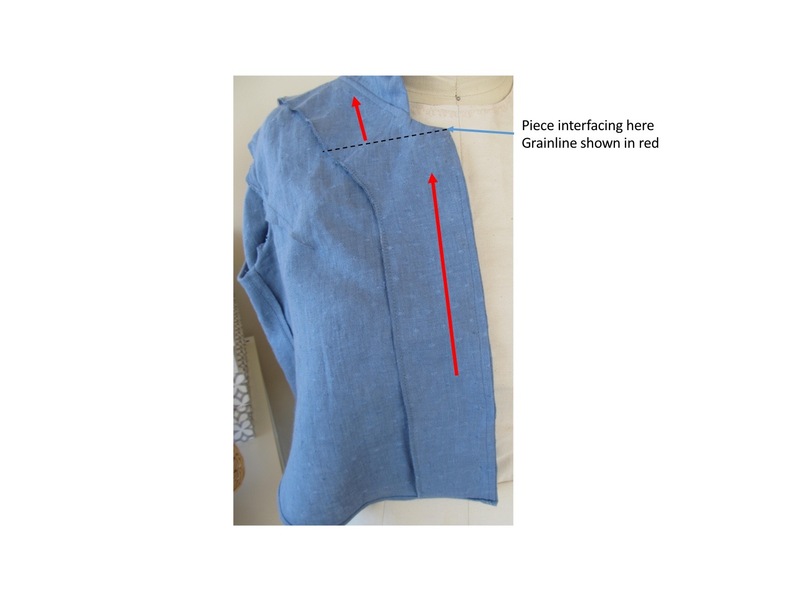 I drew a new neckline, added an extension for the button closure, shortened the pattern and added a curved shirt tail hem. When it was finished, I discovered I had shortened it a little too much. This version is wearable, but I’m going to lengthen the pattern before using it again. 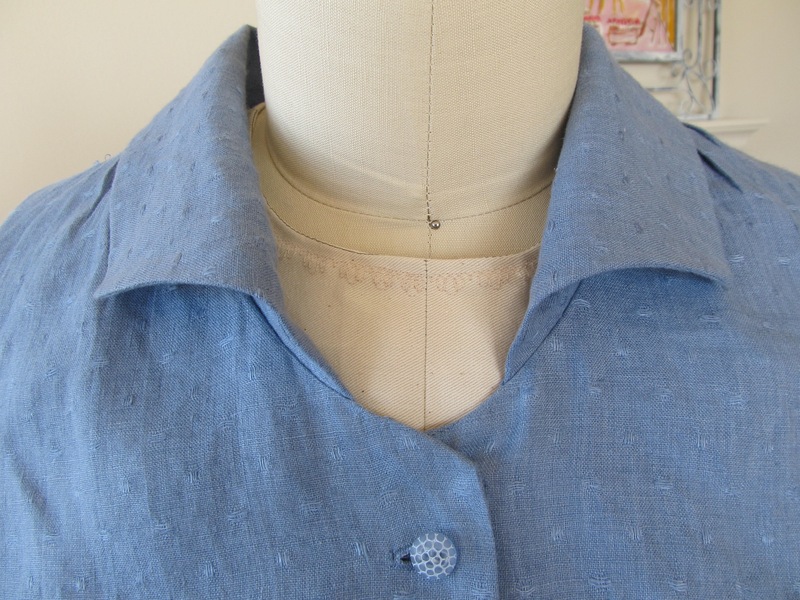 I drafted new front and back facing pattern pieces and used the rolled collar and short sleeves with split hem and button detail from the linen version of my shirtdress. The shirt went together without a hitch, which should have alerted me that there was a problem lurking somewhere. I didn’t mark where the collar was supposed to end in the front. The center back and shoulders were marked and that segment fit perfectly. When I held the collar-to-extension seam sections together they matched after both pinning and sewing, so I thought all was well. I was wrong. When I put the finished shirt on I wasn’t happy with the way the front neckline looked. Something seemed off about the bit between the end of the collar and center front. I showed it to Sarah Veblen during our next mentoring session and she agreed something was wrong. She compared the pattern piece, which had the end of the collar marked, to the finished shirt and discovered that that little segment of the neckline had stretch more than half an inch. Surprisingly, the interfaced facing had stretched the same amount. Sarah’s advice was to unstitch, steam both the fashion fabric and facing into their proper shape and restitch. That included unstitching understitching, removing the top snap and sewing the very last bit at the extension by hand. Can I tell you how much I didn’t want to do that after thinking I was done with the project? The unstitching wasn’t terribly painful once I got started. It was helped by the fact that I did it with my feline sewing assistant in my lap. The steaming was more of a project than I’d anticipated. It took several rounds of pinning to match the pattern, transferring the pins to hold the fabric to the ironing board cover without the pattern, steaming and leaving it to cool and dry. Little by little, the fullness came out. Then the entire process had to be repeated for a total of four segments – both sides of the fashion fabric then both front facings. One thing I did for the first time with this project was make horizontal buttonholes. 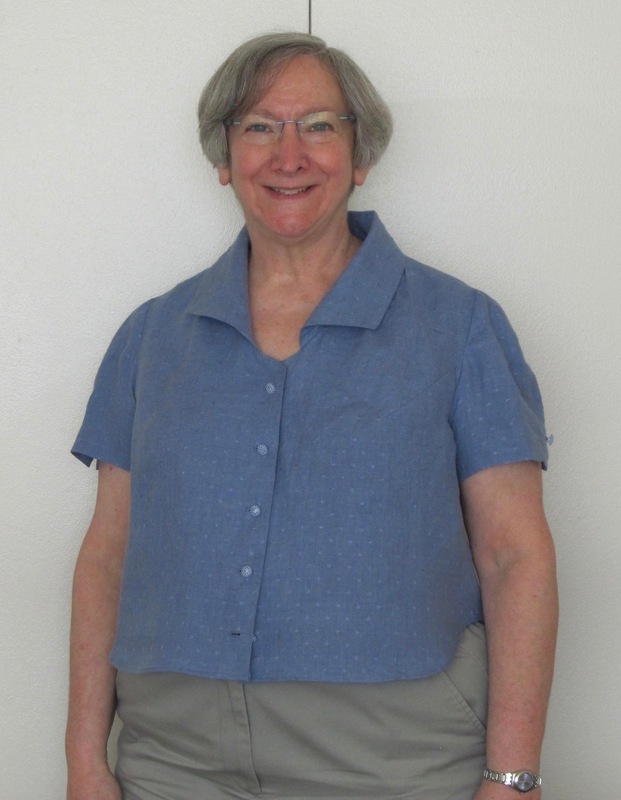 I know the “rule” is that you use vertical buttonholes on blouses and shirts and horizontal ones on jackets and coats, but Sarah Veblen encourages her students to ignore that rule. I think she’s right from both a practical and an esthetic point of view. These buttonholes won’t splay open when I move and the buttons won’t come out the way they sometimes do with vertical buttonholes on a fitted blouse. The bonus is that I really like the way they look. I’m sold on using them. 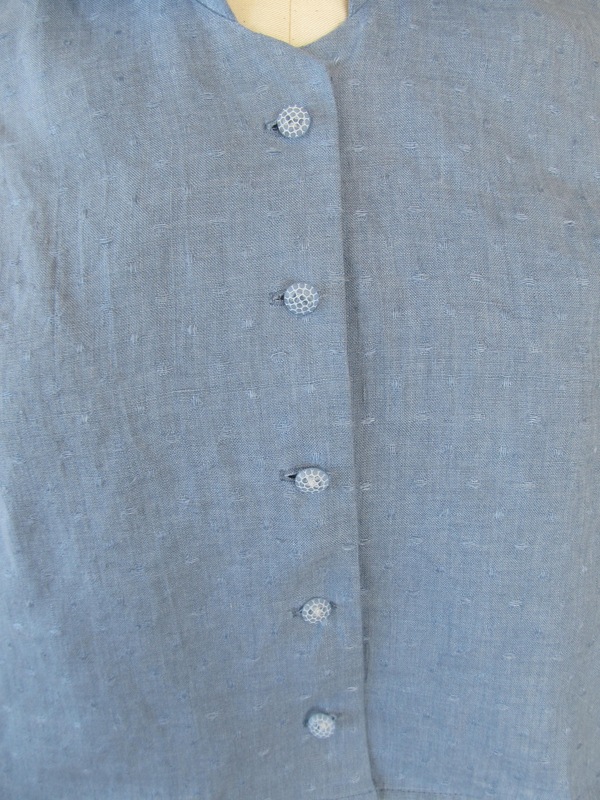 Using the horizontal orientation also meant that I could use keyhole buttonholes for my buttons, which have shanks. In looking at the finished product critically, Sarah and I decided on some changes to the pattern before using it again. Besides lengthening it, I’d like to move the tucks out toward the shoulders so they are away from the collar. Sarah also suggested bringing the front armscye seam in just a smudge, which I’ve done. I’m also going to change the shape of the front neckline slightly and widen the collar a bit at the ends so I can get more of the graceful curved shape in front. Sarah also advised that I modify the way I interface the front facing when using a fabric that might need some extra control. 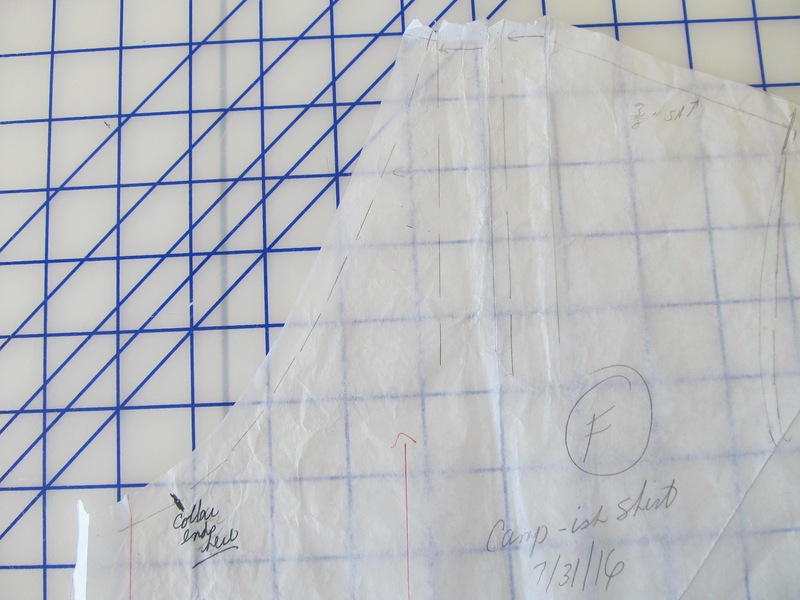 She suggested piecing the interfacing at this line so that this area can be on grain. These imperfections aren’t going to stop me from wearing this campish shirt. It’s light, cool, casual and the color is very me. I admire your persistence in creating this shirt! Learned from your experiences. Undo under stitching/stitching steaming, again and again? Oh, my! You get the medal! Great job, Wendy. Kudos for sticking it out to the wearable end. Most of us would have balled the shirt up and put it in the “undesirable” pile. It was tempting. Very tempting! Having Sarah Veblen as a mentor guarantees that when my persistence flags I have reinforcement. Your persistence is admirable. I love your color choice along with the buttons that you have selected for this camp styled shirt. I also love that you created a wing collar for your top! That takes your creative ability in design to a higher level.